From 1982 through 1992, nearly 100 Westerners were kidnapped and held hostage by Lebanese Hezbollah clans. Playwright Lee Blessing (pictured below) clearly takes his inspiration from this horrifyingly drawn-out affair and turns it into a piece of theater that is both an educating history lesson and a moving love story. 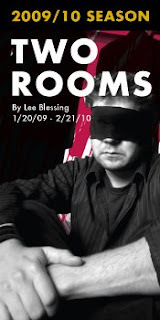 Two Rooms is the play, written in 1988, which opened this past week at the always-excellent Everyman Theater in Baltimore (which, if the three plays I've seen there are any indication, is quickly replacing DC's Woolly Mammoth, as the region's best theater). Dawn Ursula plays Lainie Wells, who is Michael's grieving wife back home in the U.S. She locks herself away most days in what used to be Michael's office. Ursula, like all the actors here, get the tone and emotional pull just right. She is being tugged on from two sides to do "the right thing." Tim Getman is journalist Walker Harris, who befriends Lainie in an attempt to do more for her than what the government has offered. Getman walks the line well of being a likable idealistic reporter and a Pulitzer-seeking egotist. I related to his character well and thought he got the role just right. Deborah Hazlett is coming at Lainie from the other direction as the secretive, move-slowly-and-diplomatically State Department official Ellen Van Oss. She provides the spot-on ammunition (and the play's very few uncomfortably humorous lines) for why those close to hostages must feel so empty and helpless. Two Rooms focuses on the stark setting of both the hostage and his wife. The two rooms are virtually blank. The set is the sparsest one I've ever seen. But I left the theater full of imagery and wanting to get back to the essentials of life. A more natural, less consumeristic way of life. Blessing is clearly an under-known talent, and the four actors in Two Rooms serve him extremely well. Don't miss this play.